The total length of pavements in Seoul is 2,788km, the equivalent of three times the round-trip distance of Gyeongbu Expressway and 1.2 times the total area of Yeouido. 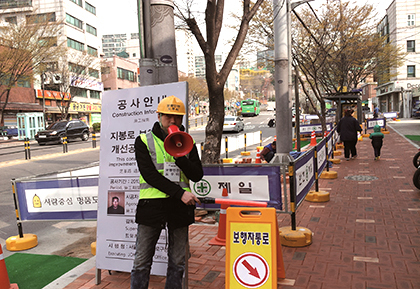 Statistics show that Seoul citizens spend an average of 70.3 minutes a day on pavements. The Seoul Metropolitan Government has come up with “Seoul’s 10 Commandments for Paving Blocks” to make Seoul a city of happy citizens. These are based on the belief that Seoul citizens have the right to a satisfactory experience when walking on pavements, where they begin and end the day. safety accidents caused by weak paving blocks.